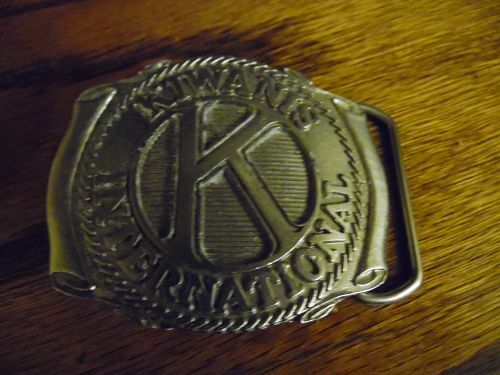 VINTAGE 1970s **KIWANIS INTERNATIONAL** Organization belt buckle. Silver pewter finish. Maker unknown. Great condition, and all original. Measures 2 3/8" x 2 7/8". Mallard duck hunting belt by Siskiyou Buckle Company in 1983 in Williams, Oregon. Two ducks with cat tails flying over a lake. It is marked V-10 on the back and reads: Few sights are as beautiful as wild ducks winging their way across a lake early in the morning. Wild mallards are beautiful birds and are one of America's wetland birds. 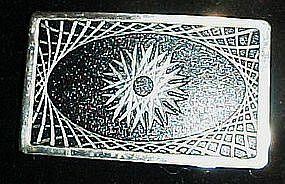 The buckle is 3 1/8" wide x 2 1/8". It accepts a 1 1/2"- 1 3/4" belt. 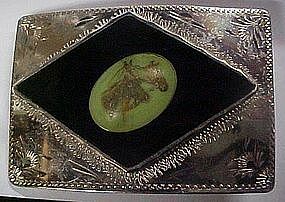 Beautiful oval shape belt buckle measures 2 1/4" x 3 1/2. Stamped Mexico. No Sterling or 925 marking so this may be Nickel silver. 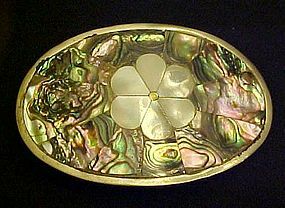 Gorgeous abalone inlay with white shell flower in the center. Perfect condition, and a lovely piece. 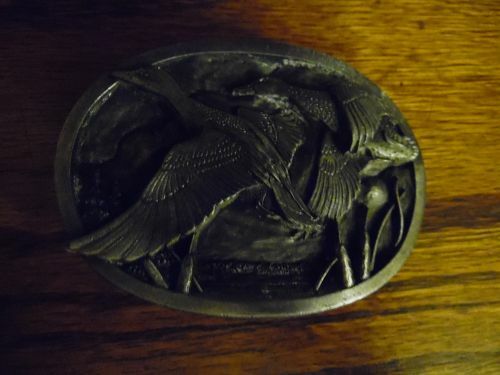 A Crumrine Bronze and silver plated belt buckle. Sticker on back reads: El Arturo Bronze Jewelers and Silversmiths. Inscribed Crumrine, Inc. Measures 5 inches wide and 2 high. Ornate flower design on buckle. Excellent condition. A very pretty buckle for any horse lover. Chrome plated to look like silver. Large diamond is black resin with an oval of three horse heads cast inside. Buckle measures 2 x 3 and is in shiny wonderful condition. One teeny area by the diamond that is a little flake, but hard to notice. No makers mark, but made nicely. I have an entire set of these vintage buckles made by BTS, and are solid brass. This has a leather cover design of a cowboy on a bucking bronc. 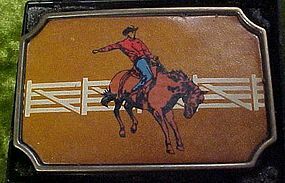 A nice western buckle in the original plastic snap case. See the others I have listed. Measures 2 1/4" x 3 1/2". Price is for one buckle. 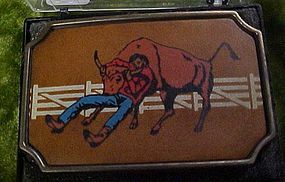 I have an entire set of these vintage rodeo typle buckles made by BTS, and are solid brass. This has a leather cover design of a cowboy wrestling a steer or bull dogging. A nice western buckle in the original plastic snap case. See the others I have listed. Measures 2 1/4" x 3 1/2". Price is for one buckle. I have an entire set of these vintage buckles made by BTS, and are solid brass.This has a leather cover design of a cowgirl barrel racing. 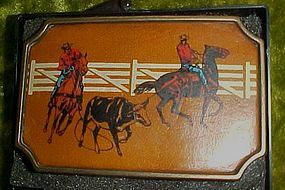 A nice western buckle in the original plastic snap case. See the others I have listed. Measures 2 1/4" x 3 1/2". Price is for one buckle. I have an entire set of these vintage buckles made by BTS, and are solid brass. 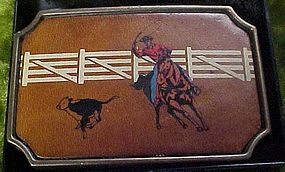 This has a leather cover design of two cowboy's team roping a calf. 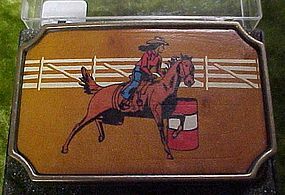 A nice western buckle in the original plastic snap case. See the others I have listed. Measures 2 1/4" x 3 1/2". Price is for one buckle. 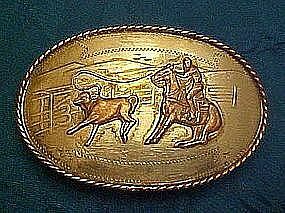 I have an entire set of these vintage buckles made by BTS, and are solid brass.This has a leather cover design of a cowboy roping a calf. 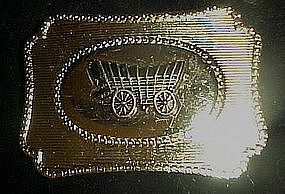 A nice western buckle in the original plastic snap case. See the others I have listed. Measures 2 1/4" x 3 1/2". Price is for one buckle. 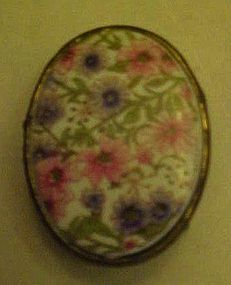 an adorable ladies belt buckle of porcelain floral chintz set into an antiqued brass buckle. Measures 1 1/4" x 1 5/8". Great condition but not aware of the maker. 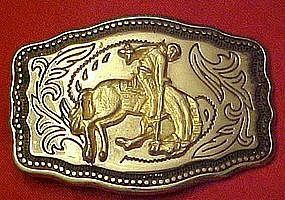 Western belt buckle with a cowboy riding a bucking horse.Silver tone with black accents and bronc rider is gold tone.made in USA. Measures 1 3/4" x 2 5/8". Nice condition and is not scratched. 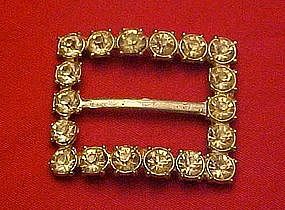 Vintage 1930's silver tone buckle measures 1 1/2" x 1 3/4". Studded wit large clear rhinestones. All stones intact. 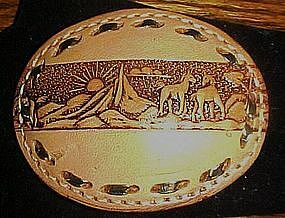 Nice large hand tooled leather buckle with a design of mountains, the sun and wild horses. Measures 3 1/8" x 4". Smooth leather outside and suede inside. Metal buckle, with this hand stitched leather cover. Nice condition A small scuff by the stitching. Shiny chrome plate belt buckle with gold color trim. It has a covered wagon in the center. Measures 2 1/2" x 3 1/2". Excellent condition. Shiny and like new buckle measures 2" x 3 1/4". Chrome geometric cuttings make a nice pattern with black contrast. Excellent condition. Nice new looking western buckle appeard to never have been worn. 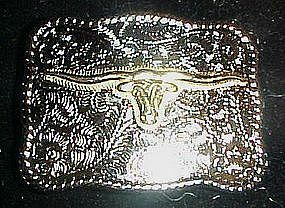 Silvertone with western designs, goldtone rope border and Texas longhorn steer head. Measures 2" x 2 3/4". Shiny and bright, excellent condition.